That’s what Sun Valley Ski Education Foundation Gold Team rider Farrington did in unexpectedly winning the 2014 Winter Olympics women’s snowboard halfpipe gold medal at Krasnaya Polyana, near Sochi, Russia. The 24-year-old Westminster College (Utah) student who grew up on a Bellevue cattle ranch joined an elite sorority of women’s snowboard halfpipe gold medalists Wednesday—in fact, she defeated the last three Olympic gold winners. She did it with a full day of good, hard Idaho work, riding every run possible, six in all, and saving her best for last. With her parents Locke and Gary Farrington watching in delight, Kaitlyn captured the gold by edging defending Olympic champion Torah Bright, 27, of Australia, and American teammate Kelly Clark, 30, for the title. Farrington, wearing bib No. 21, posted a score of 91.75 in her second run of the 12-rider finals. It was good enough to beat out Bright’s 91.50 that gave the Australian silver. Winning gold is one thing, but it was how Farrington did it that captured the hearts of viewers and won over Idahoans who enjoy the confluence of hard work and accomplishment. She was loose and having a great deal of fun. When she was done, she seemed as surprised as anyone—gracious in victory and complimentary of her Idaho and Sun Valley-area upbringing. Her smoothly technical and risk-taking gold medal run, the sixth run that Farrington attempted on a full Wednesday of riding, consisted of a creative mix—pop tart, switch backside 720, backside 900, alley-oop 540, backside 540 and frontside 720. Farrington’s duel with three Olympic gold medalists was called a “fierce firefight in the Rosa Khutor halfpipe” by the U.S. Ski and Snowboard Association News Bureau. Sun Valley Ski Education Foundation snowboard coach Andy Gilbert said on the organization’s website: “The great thing about her run was her landings were all really clean. She dropped in air to fakie, into a switch backside 900—pretty much that trick did it for her. There are no girls doing that trick. Indeed, four-time Olympic finalist Clark, the most successful rider in the sport’s history, was also appreciative of Farrington’s effort, but worried at the toll it could have taken. Clark qualified first in the 27-rider field with a score of 95.00. Farrington was fourth in her 13-rider qualification heat with an 87.00 (another qualifying run was 34.5), so she needed to compete in the 12-rider semi-finals. In the semis, Farrington put down an 87.50 first run for the top semifinal score. She and five others advanced to the final to join the six riders who made the final by virtue of their qualifying scores. Afterwards, Clark told the USSA News Bureau, “I was really hoping to make it straight through to finals because I know I’m much better rested. But I talked to Kaitlyn last night and she said, ‘I’m going to plan on riding all day.’ And I’m like, great, it’ll be a bonus if you don’t have to. In the first run of the finals, Farrington came out swinging. She needed a 73.26 to take over first place and put down what analyst Richards called a heavy run, 85.75, a score that Richards later said was underappreciated because of its technical prowess and scored too low by the judges. 1996 Olympic gold medalist Hannah Teter, 27, of Belmont, Vt., followed Farrington’s solid run with a 90.50 and seemed in strong position. Two-time X Games superpipe gold medalist Bright, 27, from Cooma in New South Wales, pulled out too fast from a 540 and settled for a first-run 58.25. The last to take her first run was Clark, the 2002 Salt Lake City halfpipe gold medalist from Vermont who is the only female rider to land 1080s. That’s where she piles up points. But Clark made contact with the lip of the pipe on a 720 and tumbled with plenty of hang time 20 feet onto her back, for a 48.25. Each rider had a second chance, since you keep your best score. And Farrington made the most of it with a 91.75, bumping Teter into second place by 1.25 points. It put a great deal of pressure on Teter, who couldn’t afford to sit back. She went down and scored 26.75, so her best possible result was silver. Bright, seventh in women’s slopestyle earlier in the week, rode next and responded well with 91.50. That score assured Farrington of a medal and left the final sorting out of the podium to the second run of Kelly Clark. Despite falling hard on her back earlier, Clark responded like a champ. Carrying lots of speed, she landed her 1080, but it wasn’t a perfect landing. The judges deliberated at length. Clark sat next to Farrington at the bottom and breathlessly awaited the score. Waving her arms joyfully, Farrington seemed as loose at the bottom as she was in the pipe. Clark’s score finally came in, 90.75, giving her the bronze. And Kaitlyn the gold. With her victory, Farrington became the fifth different woman to win the Olympic halfpipe gold since the competitions began in 1998 at Nagano, Japan, with German Nicola Thost claiming the first-ever gold. The Farrington win gave the U.S. its third gold medal of the Games, all in snowboarding to that point. It wasn’t the first time Farrington saved her best for last. Just three weeks ago, Kaitlyn needed to win the final Olympic qualifying event just to finalize her spot on her first U.S. Olympic snowboard halfpipe team. And she made the team in style, winning the final race of the Sprint U.S. Grand Prix Series Jan. 19 at Mammoth Mountain, Calif. So, along with Clark and Teter, Farrington made the four-woman U.S. Olympic halfpipe team that also included reigning world champ and first-time Olympian Arielle Gold, 17, of Steamboat Springs, Colo. 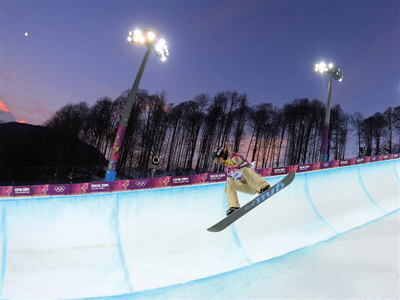 Unfortunately, Gold crashed in Wednesday’s Olympic halfpipe practice and injured her shoulder. She had to withdraw from the competition. Farrington is the 19th SVSEF Olympian and second gold medalist, with skier Picabo Street capturing gold in super G in the 1998 Winter Olympics at Nagano, Japan. She is the fourth straight SVSEF snowboarder to compete in the Winter Games dating back to Sondra Van Ert in 1998 and 2002, Graham Watanabe and Aprilia Hagglof in 2006, and Watanabe again in 2010. The SVSEF was named USSA Snowboard Club of the Year in 2013. 1—Kaitlyn Farrington (USA) 91.75. 2—Torah Bright (Australia) 91.50. 3—Kelly Clark (USA) 90.75. 4—Hannah Teter (USA) 90.50. 5—Rana Okada (Japan) 88.50. 6—Xuetong Cai (China) 84.25. 7—Sophie Rodriguez (France) 79.50. 8—Shuang Li (China) 73.25. 9—Jiayu Liu (China) 68.25. 10—Mirabelle Thovex (FRA), 67.00.